Discussion in 'MOC 2019 Challenges' started by Justagirl, Jan 9, 2019. Hello hello fellow MOC’ers welcome to day 9 of our month of challenges. Can you believe we have already completed over a weeks worth of challenges and hasn’t it been tonnes of fun! Todays challenge is a colour challenge and the colour of choice is WHITE! The colour WHITE is the opposite colour to black and is by definition the lightest colour and is achromatic (having no hue). It is the colour of fresh snow, chalk and milk. There are many variations of white and of course our monitors show differently I thought we could use this colour swatch as a guide and as a reference for when or if you choose to recolour elements in your digi stash. N.B: As a rule of thumb remember that when you start adding black to white you get grey and when you add yellow to white you get cream so please steer clear of really distinct hues of grey and cream as they are not considered white because you are now adding a hue to them. There are also so many symbolic definitions of what white represents and I thought I’d list some here as they may just inspire you in picking a theme for your page so lets have a look at a few. Some of the standouts are brilliance, illumination, safety, heaven, goodness, spirituality, softness & perfection. In its broadest form white usually has a positive connotation and thats gotta be a good thing! 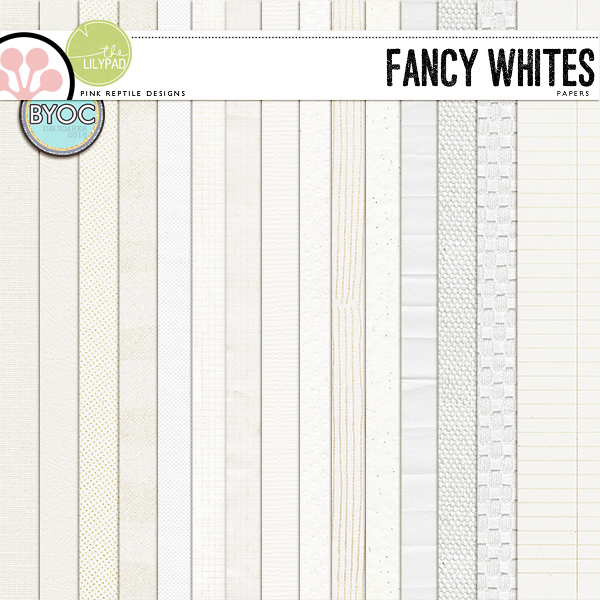 So here is the fun part....you are going to be creating a beautiful white on white page. The only other colours allowed will be in your photo that is if you choose to use a colour photo however you are also most welcome to use a black and white photo if preferred. If you choose to add a title, you need to use either a white one or alternatively a white vellum or clear plastic/acetate alpha. If you include the date or journaling you can leave that black, but you should make them small enough that they don't dominate your page. If you use ephemera or a small element like a label or word art that has black in it, again keep those to a minimum so that your page is overall white. Use only white elements and papers in your design (see above for Tints of White colour swatch as a quick reference guide). The only other colour allowed on your page is in your photo however you can use a B&W photo if preferred. Avoid distinct hues of grey and cream. If you choose to add a Title you need to use either a white one or alternatively a white vellum or clear plastic/acetate alpha. If you include the date or journaling you can leave that black, but you should make them small enough that they don't dominate your page. If you have a small element like a piece of ephemera, a label or word art that has black included in its design, again keep those to a minimum so that your page is overall white. How I created my page. Here is my example page of my beautiful niece. I decided to use lots of paint textures on top of a canvas background. I pulled heaps of coloured elements that I thought I might like to add and then I played around with desaturating them to remove colour and tweaked the lighting values to convert them to white or a variation of. I then built my page by adding the white stitching, mesh, foliage and plenty of flowers in varying shapes and form, to create movement and to also add contrast and depth. By adding dimensional shadowing and texture to my page it has created slight variations of white but you can see there is no base cream or grey included in my page. Some tips on how to make white on white work. For me when creating a WHITE ON WHITE page you have to consider texture, form and depth. So to get you started think about using items that are generally considered to be white like lace, doilies, photo mounts, cut files and textured or embossed papers. If you’re looking to really step it up a notch consider playing around with styles and actions if your program allows it. This will enable you to add even more definition to elements in a textural way. Lastly and most importantly don’t forget to add depth by layering, stacking and finishing off with shadowing. Pages should contain at least 75% current Lilypad product (currently for sale in the store from either permanent designers or guest designers). I can’t wait to see your WoW pages! umyesh, NancyBeck, KarenW and 13 others like this. You are welcome to use more than one photo. However remember you are creating a WoW page so using multiple photos could potentially detract from the overall colour aspect of this challenge. This technique might be slightly longer than others. For me this way allowed me to have more control over the lighting input and output levels so that I could retain much more detail in the elements I pulled from my digi stash. Starting off by colour desaturating my element gave me a neutral tone to begin with, preventing any of those pesky cream tones from appearing! Karen, heathert, littlekiwi and 1 other person like this. Woot woot! Excited about this one! AliSarah Oh great. Now I have pixie dust in my hair! Wow!! I am going to have to think about this one a lot!! Great challenge! Wow, never even heard of white on white. I’ve never recoulered an element either. This is going to be a steep learning curve for me. Ok...this is the first challenge this year that I actually have no idea how I am going to do this. Eek. AJK, Justagirl and littlekiwi like this. SUPER excited about this challenge! I adore white on white - and your layout is really gorgeous, Em! Tree City and Justagirl like this. May we have more than one photo? tinkerbell1112 and Justagirl like this. Just hope, everything is white enough. Ferdy, AlannaH, *gina* and 8 others like this. This was really hard. I recolored all to white and added just a shadow. Oldenmeade, Iowan, paula kesselring and 13 others like this. BevG, Heidi Nicole, *gina* and 8 others like this. heathert, Justagirl, tammybean004 and 9 others like this. Very interesting challenge ! Thank you ! And great layouts so far !